I have several thousand images from the Century of Progress in my collection and am pleased to share some of them with you. 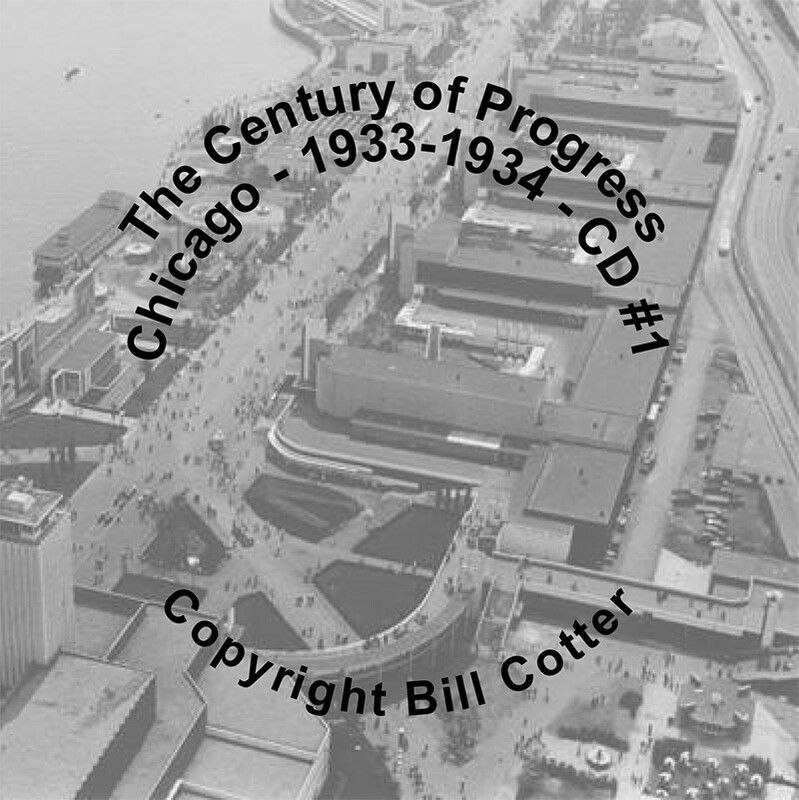 Two different CDs of high-resolution images are currently available, priced at $10 each. There is a flat fee of $7.50 for Priority Mail shipping, no matter how many discs or books you order. 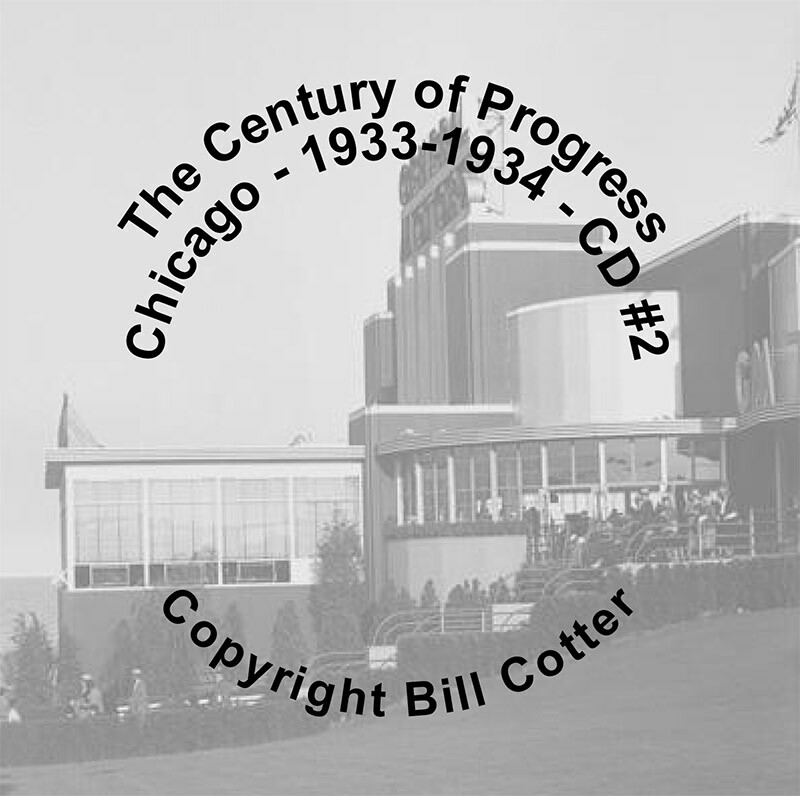 A detailed list of the contents of each disc, along with contact sheets of the actual images, can be found by clicking on each of the label images below. Shipping to Canada and other countries will be via Air Mail and may be higher in cost - please write for details. Please note all prices are listed in US dollars. You can build an online shopping cart and pay immediately through PayPal by clicking on the PayPal buttons below each image. A new window will open and you can add/remove items from the cart before checking out and paying through PayPal. You can also order by mail - just print it out the order form and mail it in with a check, money order, credit card, or debit card information. 1) The CD is not to be duplicated. 2) Prints made from the photos are for your personal use only. Photos cannot be sold, traded, bartered, put on a web site, or used for any commercial purposes without advance written permission. What format are the images, and what is needed to view or print them? Each picture is a JPG file, an industry standard format which can be read in just about every image editing and viewing package, as well as in most web browsers. Many DVD/Blu-Ray players can also display JPG files; please check with me if you have any questions about your player before ordering. How were the CDs created? The original 35mm slides and negatives were scanned on a Nikon Coolscan scanner at 4000 DPI. Larger negatives and prints were scanned on an Epson V700 at various resolutions depending on the size. Digital Ice was used for color correction and dust/scratch removal. Additional cleanup and cropping was done in Photoshop. All pictures were saved at a JPG setting of 10 to provide high quality images. What type of cameras and film were originally used? A variety of cameras and film stocks were used. They range from 35mm to larger negatives. How is the quality of the pictures? To be honest, it ranges from some obvious amateur shots which could have benefited from a tripod all the way to some that are absolutely beautiful. A thumbnail view of each picture is available on the contact sheets to help you decide. You can also download a full-size sample. If I don't like the CD can I get a refund? Just like with music CDs and videos, discs are non-returnable. Defective discs will be exchanged for the same title. If you have questions about a specific image please drop me a note and I'll do my best to answer it. In case it makes you rest any easier, I have sold many CDs so far and no one has asked for a refund. How do I know you won't just take my money and not send me anything? You can check out my feedback rating on eBay - seller name billcotter. Have any questions? Just drop me a note.